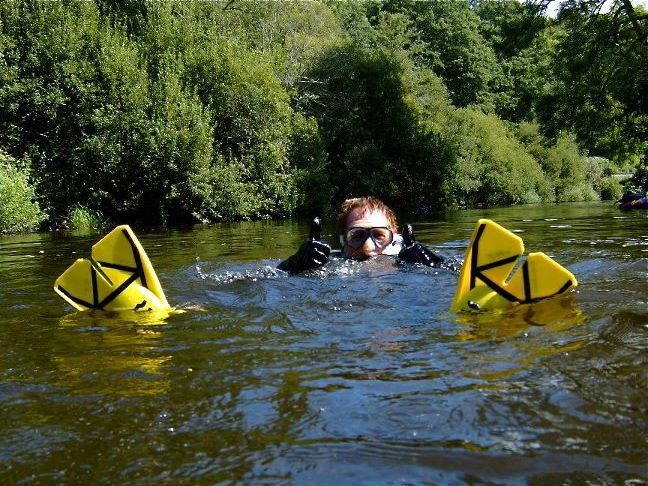 Snorkelling in the UK is often forgotten about as warm seas beckon just a short flight away these days, and often UK water requires a little more in the way of layers as the water temperature can be fairly low. BUT, with a little preparation equipment-wise you will discover that the seas, rivers and lakes of the UK are full of life! I was recently flicking through a Dive magazine when I came across a small article about Andy Torbet, who was touring the UK with his snorkel to show the potential of underwater Britain, and the words “looking for people to join him” got me dropping him an email immediately. Here was my chance to go and do something I had been considering for a while, and when the river Dart in Devon was suggested, I arranged to meet Andy in Totnes. Rob Yates another of our UK Active Outdoors team was also quick to jump at the chance and so before we knew it we were heading down to Devon with a back seat full of fins, wetsuits and snorkels. We met up with Andy Torbet and were also joined by Dan Bolt, a local underwater photographer and guide to the three mile section of the river Dart we were about to snorkel. Finally we were joined by another snorkeler also called Dan, who was lucky enough to have a drysuit with him, and five-strong we headed up stream to our get in point. Getting kitted up was a little strange, after all what was I going to need to wear? We had just scraped in to September and although the sea is generally warmer this time of the year, rivers can be a little different. With this in mind I opted for warmth over everything else and went for my winter wetsuit, winter boots and winter cap. I borrowed a pair of fins from a friend, normally used for bodyboarding, but got the thumbs up from Andy as the shorter fin would allow me to move over shallower areas with more ease. I decided I would leave my gloves off to start as I was also attempting to use a camera, so big gloves don’t help a great deal. Little did i know the gloves would stay in the bag for the duration of the trip, packed with some other gear on the snorkelling raft that Dan had brought with him! Cameras out and flippers on we slowly entered the clear waters of the Dart. The first dunk underwater with my face was a little chilly and I did wonder if I would last the duration of the trip, but it’s amazing how your body acclimatises, and I soon felt comfortable face down. Instantly you are struck by the amazing colours that the many different shaped pebbles were, especially the bright green ones! We slowly made our way down stream, all on slightly different lines, exploring the banks and deep holes. It even became warm at time when the sun shone across your back which meant concentrating on what you were looking at rather than staying warm. The first fish I spotted were the humble Brown Trout with their bright red spots and unlike the brief glimpse from the bank, because we were gently floating in to their world we could get to almost touching distance. in fact I actually had a small Trout in the palm of my hand briefly. 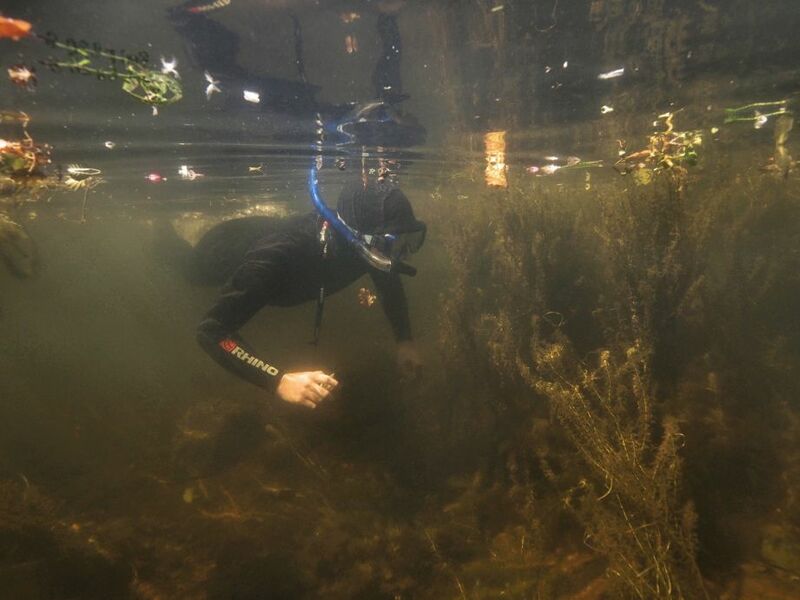 The depths changed and the scenery with it, one minute we were in shallow, rocky fast running water, and the next deeper slow moving water full of large underwater forests of weed. Swimming through these was a little strange at first, but exploring them looking for a hidden fish was brilliant. I almost didn’t see Dan taking pictures and just for a second a big lens and black shadow next to me freaked me out. The biggest fish of the day was a Pike in probably about eight feet of water which just went right under me as if I wasn’t there. 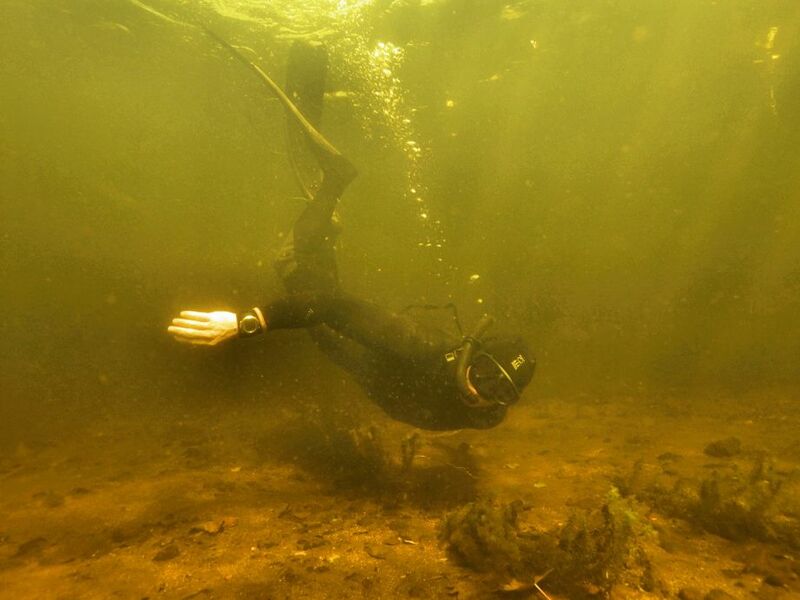 The deepest water was under a huge Oak tree which just happened to have a rope hanging from it, Andy was first to jump in wearing full snorkel gear, not only did it look funny but felt funny clambering up the banks with fins on! It was a nice break from being face down and a chance to play up for the camera! Moving on from this point we carried on exploring the river bed which seemed to change as quickly as the sun behind the clouds. With every different habitat we found different plants and fish, and to be honest really kept the interest in exploring more. The deep weed banks also gave us a great excuse to get some pictures and for Andy more pictures towards his project and future book. 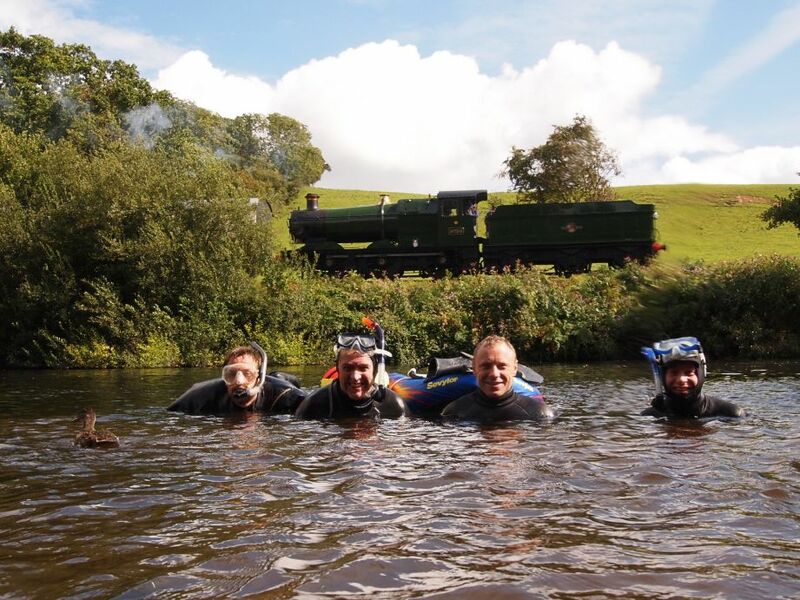 When we finally reached our get out point, which flew by, we just had time to get a picture with the steam train in the background and make friends with a young Mallard duck, who found five men dressed from head to toe in neoprene very interesting! Next time you walk past your local river, beach or lake, think to yourself, do I know what is in there and do I want to? To find out more about Andy Torbet and his project, check out the link below. Pictures by Dan Bolt and Rob Yates.